Cupcakes 'n Daisies: Another Quilt Is Home . . . .
Virginia's Star, Lifetime Quilt Number 70, is back home from the quilter. I'm very happy with this quilt, the quilting style perfectly matches the feel of this quilt. And I had nothing to do with it! Connie Lancaster, at Quilts Plus in Indianapolis, quilted this top for me. Here's a nice closeup of the border designs, I think the crosshatching in the black checkerboards is perfect, so is that leaf design. Connie wasn't happy with my choice of this plain muslin fabric for the backing, I thought it was a good match for the front but she thought her stitches showed too much on the back. They sure look good to me and I like being able to see them. 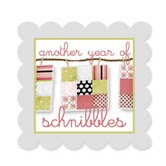 But I did promise to start sending backing with a floral print in the future. Here's the obligatory red couch photo . . .
Every time I blog about another quilt being home from the quilter, at least one person asks, "where do you keep all those quilts". Well I don't keep them all, but here's a peek at one of the rooms in my house and the quilts I have out. 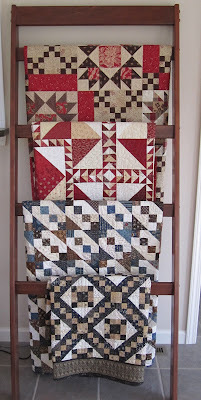 and this quilt rack which is holding, from top to bottom, Mocha Trails, Myths of Avalon, James River Blues and Jake. Simon's quilt which Cooper uses as his "place" is on the floor. That's a total of 8 quilts in that room. I move them around and replace them every month, that room gets a lot of sun and I don't want any fading going on. Cooper's "place" is where Cooper goes when we say, "Cooper, go place". He has to stay on the quilt until we say "free dog". It comes in handy when the UPS man or company stops by. We also make Cooper place before he can eat his dinner or while we eat our dinner. He's so used to placing now, that when the doorbell rings he just runs to his quilt. It's his best trick, and yes, he gets a treat every time he places! And no, he doesn't always wear a tie, we do have business casual days here too! I love each and every quilt that you make! Thanks so much for the quilt show. And nice that Cooper has his place! Love all of your quilts. I am glad to see someone else love their dog as much as we love ours. Our dog has his spot too! One day he brought in the paper without being asked, what's not to love! What a fabulous quilt! I love star quilts , and the two borders are perfect! Your talent never ceases to amaze. Also, I love seeing Cooper. What a really nice ictures with most fabelous quilts. I love them all! Beautiful, beautiful quilt. You don't like it really, you want to give it away - to ME, just pop it in the post! Cooper is just lovely, my Meg could do with a quilt I think. The quilt that came back looks great! I also appreciate the muslin backing for this shot since I am trying to get better at deciding how to quilt a quilt so love being able to see what stitch patterns were used on a quilt. I also like what she did with this one. 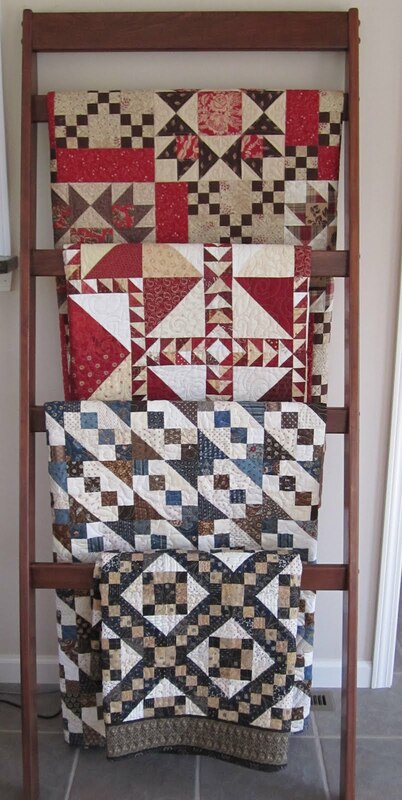 I'd love to know about the quilt ladder--purchased or made by someone you know? Another lovely quilt, and what a well-trained dog! Reggie is pretty good but the "place" command is new to me. Must keep it in mind for our next dog. My life would be so much better if Ozzie would go to his dog bed when the door bell rings. That dog is getting on my last nerve. Love the new quilt and it's checkerboard border! I love your quilt and the muslin backing is perfect for it! Love the red couch photos and the story about Cooper. Virginia's star quilt is beautiful! I remember when you were working on it you had some issues with the border....didn't it come in a kit and wasn't quite the right size? Or something like that. Anyway! It is finished, quilted, and looks right at home in your home! Cooper is such a handsome guy and I can't believe how well trained you have him to stay in his "place". Oh my, I absolutely love this quilt, and you are so right. The quilting is perfect and so is the back... Love love love it! Looks great on that red couch too! Beautiful quilts, Thelma, but Cooper stole the post! ;-) Good dog!! He looks just like our Winston in the face... oh, but our Winston is MUCH shorter! I just love Cooper so much. What a good dog. He made me smile today. Your newest quilt is another one that takes my breath away. Absolutely beautiful! Of course, if your UPS man brought Cooper biscuits, he might not "place" either. Everybody who comes to the house is just here to see Rosie... at least that's what she tells me. Love the quilts. Love Cooper. Business casual... too funny. 70 quilts - how inspiring! Your house looks lovely, and Cooper is adorable. What a good boy to have his own quilt for a "stay place". Love the quilts Thelma! Your room looks amazing! But Cooper really 'stole the show' as they say~ what a good dog!! :-) Have a happy day! Love your use of color in the new quilt. How funny about about the dog. If only mine behaved so nicely. Oh Thelma... that is a beautiful quilt. It's amazing that every quilt you have goes great with the red sofa. Mr. Cooper is adorable as usual. Wonderful post Thelma! The quilts are beautiful, and the dog story is adorable. LOVE the quilt AND the dog! Thanks for sharing! I move my quilts around a lot as well. They certainly are not just for beds anymore. Cooper is a very handsome boy and I love his tie!! I don't know what I love the most. Your quilts or Cooper!!! I wish my Maggie was as well behaved as he is. Just how did you do it? Love your quilt number 70. I also love all the quilts for the red couch. Perfect!! P.S. Cooper is perfect and cute too. Wow, and I thought Archie was obedient!! Good boy, Cooper!! I love your quilt rack, I'm thinking of asking my dad to make me one and now I've seen yours I'll be showing him the photo!!! Love all your quilts! Love the Virginia Star quilt! Beautiful! 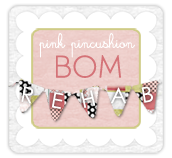 I haven't had a chance to catch up on all my favorite blogs since I've been gone, but I look forward to seeing what you've been up to. Beautiful. I love the quilting.